Providing you with luxury and relaxation, Estero Island Beach Villas #706 is an end unit situated on the top floor and is located on the popular quiet north end of Fort Myers Beach! 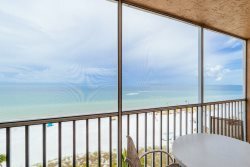 This 2-bedroom 2-bathroom, open concept condo is tastefully decorated providing a light and airy feeling and even offering you with year-round picturesque views of Fort Myers Beach and Matanzas Bay! The fully equipped kitchen has every amenity needed for an extended stay or a short get away! The master bedroom is furnished with a king size bed, while the guest bedroom has 2 double beds, allowing this unit to accommodate up to 6 people. This condo also includes an in-unit washer and dryer, as well as covered parking to insure a hassle-free stay!